I literally count the hours until FLOSSCamp (BTW, less than 16 hours remaining until we leave the city) where I will meet my friends from the Debian tribe, from the Ubuntu tribe, from the openSUSE tribe, from many other tribes, as well from my own (Fedora) tribe... is going to be fun, probably the biggest inter-tribal meeting so far in Romania (and all of it is community, no money, no sponsors, no commercialization, no companies, no politics). But before going, I feel like I have to let out my mind about the tribal debate. I am sad to see how, caving to the pressure or maybe trying to show he's the bigger man, Greg backpedaled, but I am freer, I am no CEO or such, nobody cares about what I say, so I have the freedom to speak my mind. From what I see, Greg is mostly right and Mark mostly wrong and is true Canonical is mostly a marketing company, not an engineering one. Still, if I think Mark is right on one point, and IMO he is right on one I want to acknowledge that: I agree with him about GNOME going in the wrong direction and being driven there by a group of Red Hat desktop developers that are so arrogant and full of themselves, they refuse to listen to any critics, labelling them as unneeded "stop energy". But this is not something anti-Canonical, they do it even inside the Fedora community. 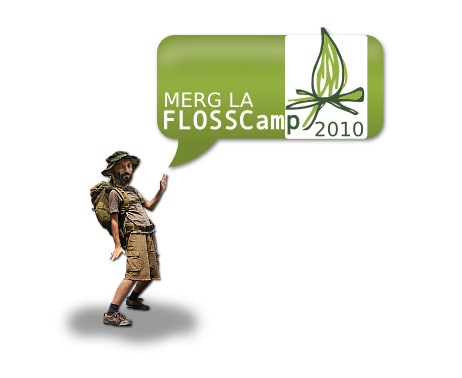 But back to my original point about counting hours (now about 13 hours remaining - this post was in editing for a looooong time, with many interruptions): I am going to FLOSSCamp!. "Canonical is mostly a marketing company, not an engineering one." I think that's a really good way to put it!